Welcome to Butterfly Feet Publications! Welcome to Butterfly Feet Publications! My name is Sherri Ward. I am a Christian writer, with two Christian fiction books published through Create Space, available on Amazon. The titles are Three O'Clock and Dusty Dreams. So what's new? Well, currently I am working on a third novel. Not gonna say more about it yet, but here's a little about the first two. I started writing Three O'Clock within a couple of years following a time of growing weary and rebellious as a Christian. Things had not been working out exactly the way I felt they should in my life, and for a time I struggled and began to backslide in my faith. After a few months, I finally realized that nothing was worse than trying to live my life in rebellion toward the God who loved me. I woke up and turned back to Him. I was amazed at God's grace toward me after that wayward time in my life. Not only did He forgive me completely, but He began to show up in my life in very unexpected ways. Giving me inspiration for Christian writing is one of them, and I have written Three O'Clock in obedience to His call. I do understand that being a Christian isn't always easy, and sometimes we struggle in our faith and may begin to lose hope and even feel like giving up. If you read my book, my hope is that you will find truth and encouragement for your own life as a Christian. Always remember God loves you! In spite of the cold, Bob could feel sweat beginning to form on his brow. Clinging precariously to the face of the cliff, he looked around for a better grip. There was a somewhat larger hollow in the rock above him, but he wasn’t sure he could safely release the grip he already had to reach for it. His toes were jammed into the deepest depressions he could find, but they were feeling less and less secure with every passing minute. As snowflakes swirled about his head in the howling wind, he looked at the frightening drop below, and was bewildered as to how he had managed to climb this high. His knees shook and his fingers began to ache with cold and from gripping the rock while he tried to figure out what to do. He thought about how the day had started out. He had arrived for morning coffee chat with The Manager feeling hopeful, thankful, and eager to get started again. Having early morning coffee chats with The Manager had been part of his routine when he had first begun his new position in The Company. He had looked forward to them eagerly, knowing he would be learning new things and that he would be encouraged just by spending time with him. However, it was one of the first things Bob had let go of when his attitudes began to slide. This time was different from the coffee chats of the past, however. They had not been talking for long before The Manager stood up and said, “Bob, let’s go for a walk.” Then he had handed him a water bottle, and they had left the building together. It had been a beautiful morning with plenty of sunshine and not a hint of the storm they would soon be engulfed in. 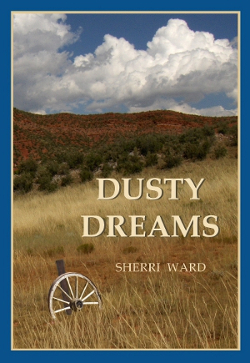 More recently I have also published Dusty Dreams. It is, again, Christian Fiction, but not as serious perhaps as Three O'Clock. For me it was fun to write and I hope you, the reader, find it fun to read as well. Here is an excerpt from the book, and you can also find a brief description as well as a preview on my amazon author page. The conversation was interrupted suddenly as the women saw Clara approaching with her little dog, Sammy. “What are you two talkin’ about?” was her blunt greeting as she arrived somewhat out of breath at the front porch. “Sammy, sit! Don’t you chase them chickens!” After scolding Sammy, she turned her sharp gaze back on Jennifer and Stella. Sammy sat down obediently and woofed now and then as he stared at the hen and her brood of chicks. my books in both paperback and Kindle versions. 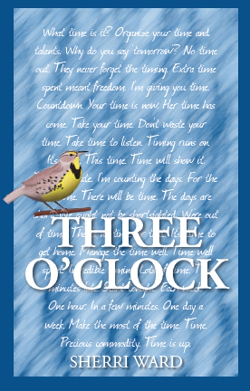 I would like to thank Dan Bennett for not only editing the manuscript but also for helping with the design, formatting and publishing process of THREE O'CLOCK.